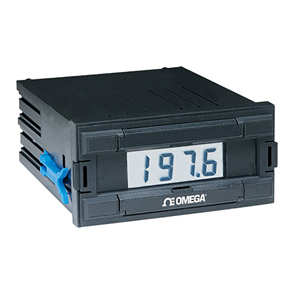 The DPM35A is a compact process indicator, requiring only than 70 mm of depth behind a panel. This instrument utilizes a 45 x 22.2 mm cutout, 1/32 DIN, with large, 10 mm display digits. Inputs are connected via a rear screw clamp connector. The DPM35A can accept input voltage ranges ,from 0 to 200 Vdc, and current from 0 to 50 mA. In addition, the unit can be scaled for both zero and span, to display in engineering units. The decimal point position is also jumper selected. The DP35 is an 1/8 DIN loop powered process indicator that can be jumper configured to select one of three input ranges, 1-5 mA, 4-20 mA or 10-50 mA. Like the DPM35A, the DP35 can be scaled for both zero and span to display in engineering units and has jumper selectable decimal point position.